Let's Do It for ME! : 100 Birdies 4 ME! Invest in ME's Biomedical Research Fund. 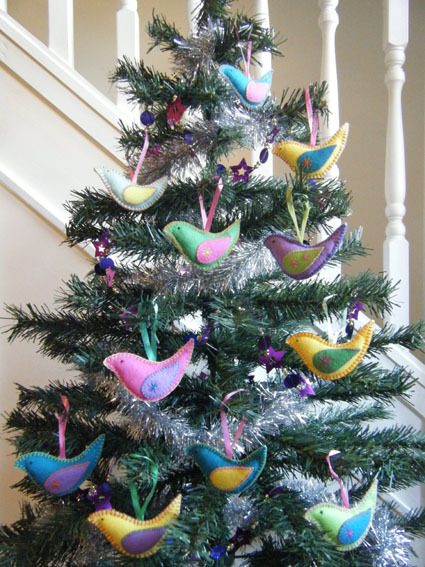 "The idea for 100 Birdies 4 ME came about in early September; I had just joined a local craft group who were looking to take part in Light Night Leeds 2011 buy making 3 'gardens' out of various crafts, and at the same time I had heard of the Let's Do It For ME fund-raising campaign to raise money for a biological research centre focusing on M.E. As with all good ideas, the idea to create something for the craft gardens that could then have a 'higher purpose' after the event just evolved. I had to make something for the craft garden that was easy to do, portable (read: able to be done from bed/sofa!) and would be unit based, so that I could manage to do it as I was recovering from a bad M.E flare during the summer myself. I spent lots of time on my days stuck in bed researching online projects and looking on Pinterest for inspiration. And then one day, I found some small felt birds which hung on a loop of ribbon and bingo! It was the perfect idea. I have spent the last few months up to the eyeballs in felt cut outs, ribbon and stuffing but I have thoroughly enjoyed making them. I have found my own health improving as I have been making birdies, and have felt like I have a purpose even though housebound for the majority of the time. I set myself the target of making and selling 100 birdies – the total made so far is at 40 but I have only sold 22 of these so far. I really don't know if I will manage to make 100 before Christmas, but I plan on keeping the project going until I have reached my goal. I wholeheartedly support what Let's Do It For ME! and Invest in ME are doing, it is about time that some proper research was done into M.E so that we can find a cause and cure the thousands of people who are just forgotten about and left to cope with a devastating illness with little medical intervention". Click here to see and order the birdies. You can find 100Birdies4ME on Facebook. Many thanks to Diana and all who choose to give her Birdies a home. 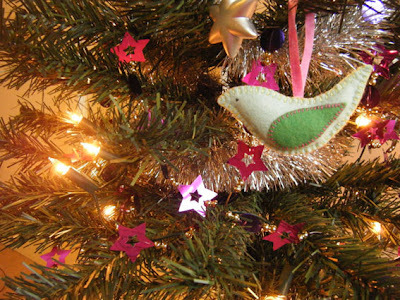 Would you like a Birdie for Christmas? As at 16th February 2012, these lovely birdies had raised £64.60 + £16.15 for ME! You can see Diana's donation to Invest in ME on our fundraising page on Everyclick.